Right now, my longest-time friend, and a bridesmaid at my wedding, is at the hospital expecting her first baby. And because timing can be funny sometimes, my other closest friend, who was also a bridesmaid at my wedding, is expecting her first baby in just two weeks. I'm so excited for them both, and I know that they, and both of their loving husbands, will be wonderful parents. With babies very much on my mind right now, I'm thinking about the baby steps we all take throughout our lives. 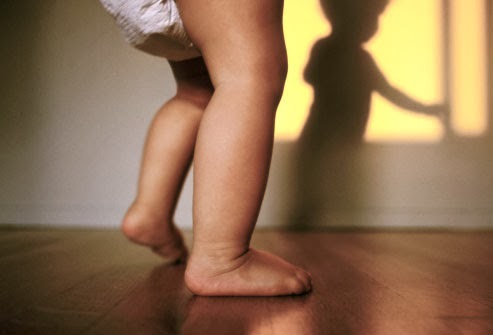 Conquering those first baby steps as a toddler probably seemed impossible to us when we were tiny, but since then, we've all taken so many more first steps. I sometimes find myself having to force myself to not feel terribly overwhelmed by things that feel huge. I wouldn't say that I'm a pessimist, but I do worry a lot, and sometimes that means worrying so much that I am tempted to never start. When that happens, I try to remind myself that just starting is the important thing. That simply doing something -- taking any step forward -- is important because it means I'm heading in the right direction. Starting to save money can easily be one of these overwhelming things. But if the plan starts small, it won't feel too painful. The baby step that can be taken today is to set up a savings account with automatic withdrawals from a bank account. Start with $20. Even if money is tight, $20 from each paycheck will not be missed. After a few paychecks, once it becomes normal to have that money taken out, increase the automatic withdrawals to $40. Since the $20 taken out is normal, the additional $20 won't be missed. And after you get used to that? Increase it again. And then again. To start from no savings, I think this is the easiest way to get started putting money aside for the goal of a savings account or the goal of using this money to pay off debt. There's no math required, nothing to remember -- the money just comes right out without any effort. Very, very slowly, it forces getting used to spending less money from each paycheck. It happens so slowly that it won't even be noticed. No one is going to have a huge pile of money after a year of this plan, but there will be more going to savings/debt, and less going to spending. It's a first step on the right track, and sometimes that first step is the most important. But there is one catch -- be careful to not increase the amounts too quickly, or the risk of simply continuing to spend the same amount of money by paying with a credit card will be very tempting, and that won't help at all in the long run! Go at the pace that's right for you, without trying to race ahead. The goal here is to just start... To change course... To take something that seems overwhelming, and turn it into one simple step towards the larger goals. To see that it's possible, and to take something that might feel overwhelming and turn it into one -- first -- baby step.